DMCA statutory minimums mean a huge penalty for UMaple. MapleStory is a 2D, free-to-play MMO published in North America, Europe, South Korea and Japan by Nexon. It's a popular game, with more than eight million registered accounts in North America alone, but not everyone wants to play on official MapleStory servers, and so it is that unsanctioned servers like that of UMaple come into play. UMaple runs an "off-the-books" MapleStory server, offering special in-game privileges in exchange for "donations" that help keep the lights on. That doesn't sit well with the MapleStory folks, who naturally filed a lawsuit; and when that suit went completely ignored by UMaple, it was granted a default judgment. But it doesn't sound like the judge in the case is very happy about it. MapleStory's lawsuit sought all profits earned by UMaple, which it pegged at $68,764.23 brought in through donations and Google advertising, but Judge Otis D. Wright II wasn't buying it. He ruled that MapleStory "only satisfactorily proves that $398.98 in profits from Google was reasonably related to [the] infringement," and thus granted the request for disgorgement of profits with an award of precisely that much: 398 bucks and a coffee. That part of the lawsuit was a big win for the UMaple folks, but then things got ugly. 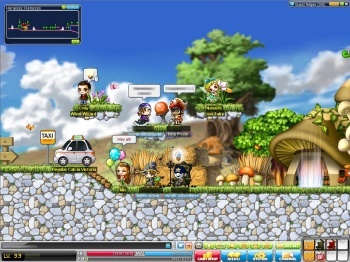 MapleStory requested the maximum statutory damages allowed under the Digital Millennium Copyright Act of more than $44.8 million, which the judge rejected out of hand in favor of the minimum damages required by the Act of $200 per infringement. That doesn't sound too bad, but each of the nearly 18,000 UMaple users counts as a separate infringement, meaning the court was forced to award statutory damages of $3,587,600. "The Court would deem even the minimum statutory amount awardable under the DMCA in this case to be a significant windfall to Plaintiff far in excess of any amount necessary to deter future infringing conduct," the judge wrote. "Further, the minimum award here likely bears little plausible relationship to Plaintiff's actual damages. Nevertheless, the Court is powerless to deviate from the DMCA's statutory minimum." The court also granted MapleStory's request for a permanent injunction against UMaple, which is fair, but rejected its claim for "reasonable" legal fees determined by a standard formula used in cases in which judgments of over $100,000 are awarded. Based on that formula, MapleStory would be granted $77.359.98 in legal fees, but the judge said that amount is "patently unreasonable in light of the amount of substantive work this case demanded" and ruled that it would only be awarded its actual legal costs, which it has 30 days to submit. As Eric Goldman notes on his Technology and Marketing Law Blog, it's an ugly win for MapleStory that serves to highlight some of the serious flaws in existing legislation. "You don't expect to see such palpable skepticism from a judge when the defendant doesn't even show to protect its own interests," he wrote. "But this case does provide an excellent example of the ridiculousness of anti-circumvention statutory damages. $3.6 million can't be the right damages award in this case, and it's so guffaw-inducing that it further erodes the legitimacy of our copyright rules."